– Ante Zizic: The 7″0 center was drafted by the Celtics in 2016 with the 23rd, first round selection out of Croatia and wasn’t active for all of last season. He was undoubtedly a “throw-in” in this trade for salary reasons, but he could present himself as a decent backup option behind starting Center Tristian Thompson in the future, as he’s a raw, 20 year old player. – Jae Crowder: The defensive specialist has been thrown around from team to team during his NBA career, but it seemed that finally found himself a home in Boston. Crowder averaged 13.9 PPG, 5.8 REB, and 2.2 AST last season, as a key role player in Boston’s run to the first seed in the east. Crowder provides this title contender with a crucial source of defensive solidity, and the mentality of keeping a pure role on the team and off the bench as he’ll likely start behind James and Love. He’s only 27 and locked up for another 3 seasons as he signed a nice extension with Boston 2 seasons ago. – Isaiah Thomas: Despite holding the smallest stature in the Association at 5″9, “I.T.” was able to lead his Celtics team to the first seed over his new team last season averaging a superstar stat-line of 28.9 PPG, 5.9 AST, and shooting 46.3% overall – good for All-NBA 2nd Team honors. The former 60th overall selection in 2011 (the same draft where Kyrie went #1 overall…) has been all over the league in his career, going from Sacramento, to Phoenix, to Boston and now Cleveland. Thomas proved last season that he is capable of being a leader and showing up when it’s time to as he gave us countless clutch moments to constantly rave about all season long. He’ll play along LeBron and Kevin Love to lead the Cavs this season, but will almost certainly see his numbers drop as he’s no longer the absolute star of the team and must give up some looks to the other 2 stars. Thomas is 28 and is on a contract year, as he has made it very clear that he wants to build up from his current cheap deal, to a max-deal in the 2018 offseason. 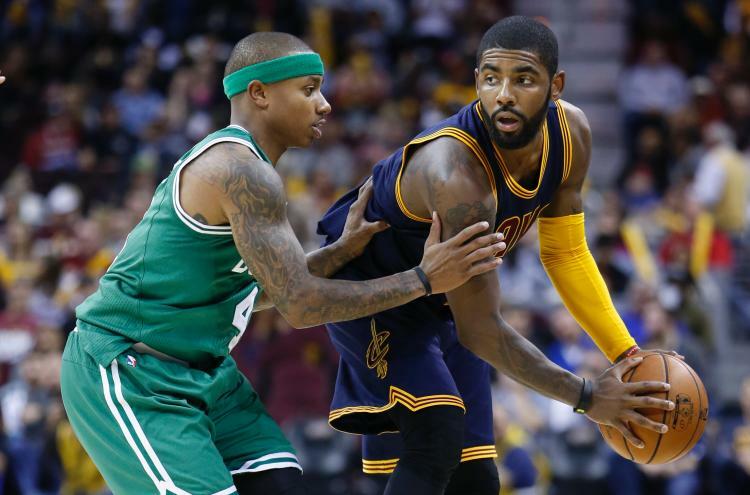 – Kyrie Irving: The former #1 pick is an absolute stud, and now that he’s alone and not in the shadow of LeBron – something he clearly desired very much as he requested the trade out of Cleveland – the sky’s the limit for the 25 year old. Irving has already collected a Rookie of the Year award, 4 All-Star game selections, including a game MVP in 2014, and of course a title in 2016 – just through 6 seasons of his career. Last season he put up numbers of 25.2 PPG, 5.8 AST, 3.2 REB and 1.2 STL en route to another finals appearance for the Cavs. Those numbers will surely increase this season and will look very similar to those of Isaiah’s last season. Kyrie has 3 years remaining on his big deal, and the whole city of Boston in his hands right now with the assistance of other young, and proven stars on his new squad. One of the biggest questions that surrounded both franchises this offseason was “what is the direction for the future” – and that may have been answered with this trade. This would require a lot to happen and truly seems unthinkable now, but is very possible if you look at it in depth. If things don’t pan out this season (as it’s championship or bust), LeBron can very easily leave the franchise knowing he brought them what they wanted in a title and much success over his second stint in his home-town, and begin to build his future brand, and look for even more success, as plenty of rumors have suggested. Let’s just say he moves to New York or Los Angeles clearing up a huge salary for the Cavs – leaving them to make a decision with Isaiah. Thomas can also very well leave to contend for a title, or to become the face of a franchise, as he’s desiring a total max-deal that will take up a whole team’s salary. If he leaves as well for one of those reasons, as he wouldn’t be useful for a rebuild, that takes two stars off their team. That leaves the Cavs with a now 29 year old Kevin Love and a 27 year old Tristian Thompson to control their franchise as they’re under contract for another two seasons. It wouldn’t be shocking to see them moved via trade to really explode everything, acquire plenty of assets and cap space, and make room for their new potential superstar in their top selection of the 2018 draft. So losing 3 “aging” stars for plenty of assets and picks, a player like Porter or Bagley, and a TON of cap space may be worth it in the end. Don’t get me wrong, LeBron, Isaiah and Love aren’t bound to be ineffective just because they’ll be nearing their 30’s, because that is completely false and they can significantly help out other franchises, but that trio is clearly not enough to beat a Warriors team that is dynasty bound. Now for Boston, it’s no-longer build up assets for the future mode, but officially win-now mode after trading the remainder of Ainge’s coveted assets and finally acquiring the star they wanted. For this season, the Celts will put out a starting 5 of all players acquired in the past two seasons through FA, trades or the Draft, and 3 players acquired this offseason including two all-stars. Not to mention they have a top-3 pick on their bench waiting to get in. Personally, I don’t think this will be the year the Celtics surpass a still solid Cavs team with LeBron as I think he is still superior to their team. But this will be an incredibly interesting year to see if Kyrie can put up top-10 numbers without LeBron and if he’s capable of leading a team to stardom. The main differential between the Celtics of this year and last year is the swap of awesome depth throughout the team, to awesome star power throughout the team. As much as they loved Isaiah as a team and a city, he wasn’t taking them anywhere in the near future, but the tandem of Kyrie, Hayward Brown and Tatum can take this team places going forward. This team became a whole lot younger with this deal as well, as Kyrie is 3 years younger than Isaiah with 3 years on his deal, Brown is only 21, Tatum is only 19 and Hayward is just 27 and has 4 years on his deal to show himself out. This gives Boston a much bigger window to grow their team and become a big time, legit contender.